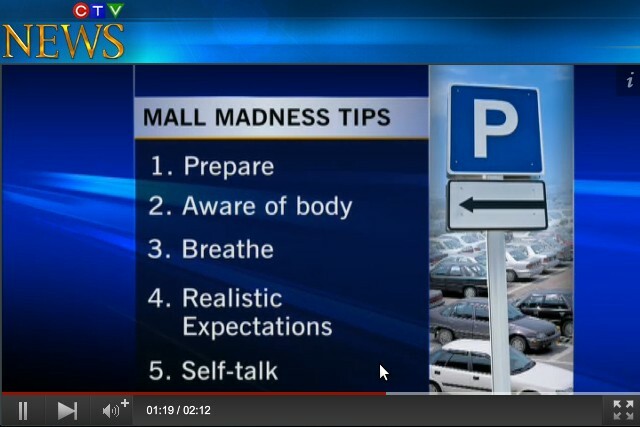 In the latest edition of Lifetime, a segment on the local CTV newscast, Pauline Chan gets some advice from psychotherapist Nicole McCance on coping with the stress of mall parking lots. McCance recommends that drivers prepare in advance for the stress: her advice on controlling lot rage is to eat a meal before you go to the mall, wear comfortable shoes, and make a shopping list. In the clip, McCance says that traffic in a parking lot is beyond people’s control, but that “they can control whether they’ve gone to the bathroom or eaten.” The segment summarizes her points in a bullet list that includes items like “breathe” and being “aware of [your] body.” This is hard-hitting stuff. Strangely (or not), none of McCance’s suggestions involved avoiding the stress entirely by not driving a car to the mall, shopping online, getting your act together so that you can shop in the weeks before the holiday crush, or simply opting out of the annual consumer frenzy. Me, I’m going to cope with mall parking lots the same way I always do: by taking a three minute stroll down to the Danforth where I’ll do what little Christmas shopping I still do. And I won’t have to perform breathing exercises, talk myself down from sidewalk rage, or circle the block endlessly looking for somewhere to park my conveyance. I feel the stress melting away already.